Many people suffer from some type of milk intolerance or allergy, and while once this would have meant dry cereal and vegan baked goods, today there are more milk alternatives available than ever before. If you’re new to the world of dietary alternatives, however, this can be overwhelming. Which one should you choose? Milk alternatives can be expensive, depending on what type you buy, so it’s important to do your research about the nutritional benefits of milk and to try new products when you have coupons. As you consider the many options before you, here are a few things you should know about these dairy case options. Among the many milk options available in your local grocery store, you may find that in addition to traditional cow’s milk, there are also goat and sheep milk options. Now, if your food intolerance or allergy includes all dairy, this won’t help much, but if you have a hard time digesting a specific protein in milk, you may want to test drive these offerings. What sets goat and sheep milk apart from many other types of dairy is that it doesn’t contain A-1 casein. Most cow’s milk contains both A-1 and A-2 casein, but it’s almost always A-1 casein that people have a hard time digesting or that causes inflammation. If you think this may be the problem, try one of these milk types or look for milk that comes from A-2 exclusive cows. 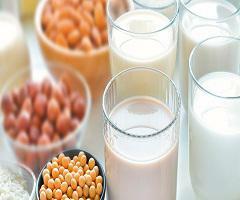 The most popular milk alternatives on the market today are nut milks, including almond and cashew milk. Almond milk, which has become such a mainstay that even Starbucks now offers it, is low in protein compared to cow’s milk, but it’s also much lower in calories. You’ll find 110 calories packed into 8 ounces of 1% fat cow’s milk, but only 40 calories in unsweetened almond milk. If you shop in specialty stores, you may also encounter macadamia nut milk or hazelnut milk, but don’t expect to grab these in your local dairy case. These milks tend to be pricier, but they’re a nice, rich alternative if you’re looking for something to put in your coffee, for example. It used to be the case that if someone had a dairy intolerance, their first choice would be soy milk, but soy seems to be falling out of favor as tastier alternatives come to market. What makes soy appealing is that it can meet or even exceed the amount of protein in cow’s milk, while typically offering lower carbohydrates and more fiber – it carries a nutritional bang. Just watch out for sweetened varieties that are loaded with sugar. No matter what type of milk alternative you prefer, the good news is that for those who can’t tolerate traditional cow’s milk, there’s almost always an alternative product in coffee shops and grocery stores today. These alternatives are also great for baking, making ice cream, and more – now you don’t need to live in denial just because you can’t digest traditional cow’s milk.